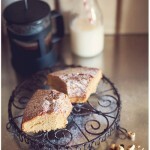 Home > Food photography > A coffee cake and I on TV! 01 Mar A coffee cake and I on TV! Everything began with a simple question the dearest chef Andreas Lagos pose to me: “Do you want to come over at the TV show Chef on Air?”… I, naively, answered positively, having in mind to see the TV show behind the camera!… little I knew! After a few days, the most polite girl ever, Areti, from Prosenghisi production company, was over the phone, talking about recipes, preparations, directions, etc. A little aloof, stage frighten… I presented myself at the studio, much more earlier than I was supposed to be there… stress you see! Well, it was much easier than I thought, as every one working there, makes you feel like you are one of the guys! Hours went by so easy next to the awesome and easygoing Eleni Psyhouli and Andreas Lagos, presenting us recipes about crab and olive bread… which both disappear in moments! My little contribution was a recipe about a coffee cake with hazelnuts… simple and full of aroma… especially for coffee lovers! Hospitality was warm and the experience more than great! Thank you all!